Have you ever experienced or sensed your heartbeat? Although such a feeling is usually completely normal, it may be unpleasant. For instance, people often describe hard beats, fast beats, irregular beats, skipped beats, fluttering, “flip-flopping” or a pounding sensation in the chest or neck. Palpitations are defined as an unpleasant awareness of heart muscle contractions in the chest. Although palpitations are very common and usually completely harmless, they may occasionally be a manifestation of underlying heart disease. Palpitations are a very common reason people visit their doctor. This is not surprising as symptoms associated with the beating of the heart are likely to get our attention and they often make us anxious. However, it is important to keep in mind that palpitations are more often caused by the anxiety itself than an underlying heart disease. The key thing is to understand that palpitations are a sensory symptom, an experience or a feeling. As such they may be difficult to grade or measure. The description often varies a lot between individuals. While some people seem to be aware of their heartbeat at all times, others have almost never felt their heart beating. Obviously, the latter group is less likely to complain of palpitations. The term arrhythmia describes disorders of heart rhythm. All types of irregular or abnormal heart rhythm fall under this term. It may be an irregular rhythm or rapid or slow beating of the heart. The term tachycardia describes rapid beating of the heart whereas the term bradycardia describes slow heart rate. Although palpitations are often caused by arrhythmia, they are frequently associated with psychiatric causes such as anxiety and panic disorders (1). Other underlying disorders such as thyroid disease or anemia may also cause palpitations. Emotional stress and lack of sleep may also play a role. Sometimes substances like caffeine, nicotine, cocaine or amphetamine are identified as the main cause. Interestingly, palpitations can occur in the absence arrhythmia. Furthermore, many patients with arrhythmia don’t have palpitations (2). 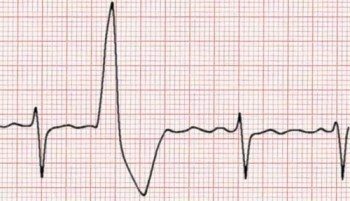 Despite the strong association between palpitations and anxiety, it is often difficult for the patient to decide which came first, the anxiety or the palpitations (3). Most types of arrhythmias may cause palpitations. Although most are benign, some are serious and may in rare cases be life threatening. Palpitations may also be caused by valvular heart disease, coronary heart disease or disease of the heart muscle (cardiomyopathy). Sometimes they are associated with other disorders such as anemia or overactive thyroid gland (hyperthyroidism). 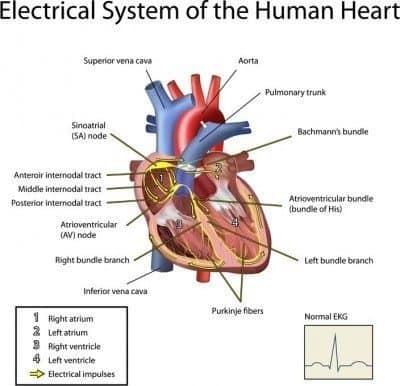 To understand the underlying mechanisms causing arrhythmias, it is helpful to understand the basics of the electrical system of the heart. The heart has its physiological pacemaker, the sinus node (SA node), in the right upper chamber of the heart, the right atrium. The sinus node emits more than 2.5 billion electric pulses during a lifetime. Next the signals travel to the area that connects the atria with the lower chambers of the heart (the ventricles), the atrioventricular node (AV node) and from there through an area called the AV bundle, or the bundle of His. Sometimes a completely normal sinus rhythm is associated with palpitations, underscoring the fact that palpitations are not always caused by arrhythmia. However, electrical impulses not originating from the sinus node frequently cause palpitations. This may lead to so-called ectopic beats or ectopic activity. Ventricular ectopic or premature beats are due to electric activity originating from the ventricles while atrial or supraventricular ectopic or premature beats originate from the atria or the atrioventricular node. Ventricular and supraventricular premature beats are the most common underlying arrhythmias causing palpitations (3). The prognosis of patients with these arrhythmias is usually very good. Sometimes bouts of rapid, repeated ventricular or supraventricular beats may cause palpitations. These are termed ventricular tachycardia and supraventricular tachycardia respectively. Ventricular tachycardia may cause dizziness and fainting. The prognosis is usually good if it is non-sustained (lasts less than 30 seconds) and not associated with underlying heart disease. However, ventricular tachycardia may sometimes be associated with adverse prognosis and risk of sudden death. Supraventricular tachycardia is relatively common. Although the prognosis is usually good, this arrhythmia commonly causes palpitations, and specific treatment may be needed to relieve symptoms. Atrial fibrillation is a common underlying cause of palpitations. It is characterized by a chaotic electrical activity of the atria leading to rapid, irregular heart rhythm. Atrial fibrillation is sometimes associated with increased risk of stroke. Because palpitations may occasionally reflect severe underlying heart disease, an evaluation by a doctor is usually recommended. However, because most people with palpitations have a good prognosis, intensive, expensive testing is usually not necessary. The most important thing when addressing patients with palpitations is to exclude underlying heart disease. All patients should be evaluated by detailed history, physical examination and an electrocardiogram (ECG). The characteristics of the palpitations are important. 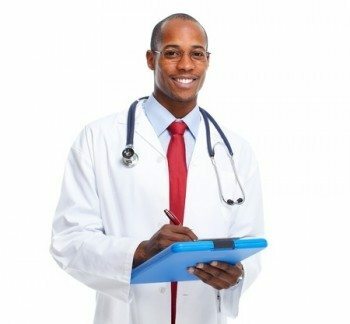 Does the patient describe fast beats, skipped beats or flip flopping? Is the rhythm regular or irregular? Are there any associated symptoms such as dizziness, fainting or shortness of breath or chest pain? Are palpitations present at rest, during exercise or both? Are palpitations present when the patients lies on his left side? The flip-flopping sensation is usually caused by ventricular or supraventricular premature beats and is therefore usually benign. This type of palpitations is often experienced while the patient is lying in bed. Palpitations are often more easily felt when lying on the left side. When lying on this side, the apex of the heart is closer to the chest wall, which may lead to more awareness of the palpitations. Hence, feeling palpitations while lying on the left side is usually a completely innocent phenomenon. The simplest measure to get rid of it is to change position. Rapid fluttering in the chest is likely to be caused by tachycardia. If it is regular, it may indicate supraventricular or ventricular tachycardia but if it is irregular, it may suggest atrial fibrillation. It is often helpful to know the age of onset of palpitations. For example, rapid palpitations at a young age are likely to be caused by a supraventricular tachycardia, while, as the subject ages, such symptoms are more likely to be caused by atrial fibrillation. Although serious ventricular arrhythmias typically occur in older patients with underlying heart disease, they may occasionally occur in adolescence, sometimes due to congenital long QT syndrome (5). Sometimes patients become adept at terminating their palpitations be specific maneuvers, such as the Valsalva maneuver. This mode of termination may suggest supraventricular tachycardia as the underlying disorder (3). Palpitations associated with fainting may suggest more serious arrhythmia such as ventricular tachycardia. It is important to know about all medication taken by the patient. For example, palpitations may occur with some drugs taken for relieving asthma and cold and cough medications that contain pseudoephedrine. Furthermore, nicotine and illicit drugs such as cocaine or amphetamine may cause palpitations. The patient should also be evaluated for other possible medical conditions. Laboratory testing for anemia and possible thyroid disease may be indicated. The physical examination is useful for identifying cardiovascular abnormalities and other signs that may be associated with palpitations. For example, it may help detect congenital and valvular heart disease, chronic atrial fibrillation and thyroid disease. An ECG is a noninvasive test where electrodes are placed on the chest and extremities for registration of the electric activity of the heart. The ECG may directly detect the underlying arrhythmia causing the palpitations. However, because palpitations are usually intermittent, the ECG is most often completely normal. In some cases, the ECG may suggest underlying heart disease such as coronary heart disease or a thickened and strained heart muscle (left ventricular hypertrophy). Sometimes isolated premature ventricular or supraventricular beats may be seen on the ECG, thus suggesting the underlying cause of the palpitations. Prolongation of the QT-interval on the ECG may suggest congenital long-QT syndrome. When history, physical examination, and ECG do not provide a definitive diagnosis, further diagnostic testing may be warranted. Sometimes further testing is needed to exclude severe underlying heart disease. It may also be performed to identify a treatable condition, thus improving the patient’s quality of life or simply to reassure the patient. Echocardiography is a noninvasive examination of the heart. It provides images of the hearts structure and function and can help identify underlying heart disease such as congenital or valvular heart disease and cardiomyopathy. However, echocardiography is seldom necessary for patients with palpitations unless history, physical examination or ECG suggests underlying heart disease. 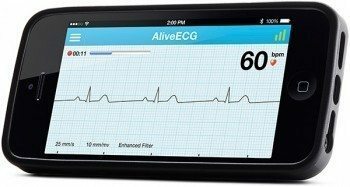 Ambulatory ECG monitoring devices are important tools for the diagnosis palpitations . The Holter monitor is a portable device that records and saves data. It is usually worn for one to three days and sometimes up to a week. At the same time, the patient keeps a diary of his/her symptoms. This may help to detect or exclude arrhythmia associated with the palpitations. Special loop event recorders can save data for longer periods of time and direct transmission of signals may be possible through telephone (6). The implantable loop recorder (ILR) is implanted under the skin and can be used for much longer time periods. It is most often used in patients with unexplained fainting but also on rare occasions for unexplained palpitations (7). Today, different types of smartphone apps are becoming frequently used to detect arrhythmia in patients with palpitations. As most patients with palpitations have an excellent prognosis, reassurance is often the most important and the only therapeutic measure needed. If there are no signs of underlying heart disease or other associated conditions, specific treatment is usually not warranted. However, due to the frequent association between anxiety disorders and palpitations, psychiatric or psychologic evaluation may sometimes be warranted. If an arrhythmia or another underlying disorder is detected, treatment will depend on the nature of that particular disorder. Palpitations are an unpleasant awareness of heart muscle contractions in the chest. Although palpitations are very common and usually completely harmless, they may occasionally be a manifestation of underlying heart disease. Although palpitations are sometimes caused by irregularities of heart rhythm (arrhythmia), they are often associated with anxiety and panic disorders. Ventricular and supraventricular premature beats are the most common arrhythmia causing palpitations. Although they may cause unpleasant symptoms, they are usually harmless. The key issue when addressing patients with palpitations is to exclude serious arrhythmias or other underlying heart disease. This may usually be done by careful history, physical examination and ECG. Ambulatory ECG monitoring is a useful tool to detect disorders of heart rhythm. I suffered from palpitations for years, sometimes so bad they triggered anxiety attacks and prevented me from sleeping. I was checked out by my doctor, wore a Holter monitor, but no issues could be found. When I adopted a ketogenic lifestyle, one of the first things I noticed, besides the immediate disappearance of the severe water retention that also plagued me, was I no longer had palpitations. So many aspects of my health improved so dramatically, that I’m not sure why they went away, but I haven’t had them since, 18 months and counting. I also noticed, as have those around me, that my general personality is much happier, so maybe the overall improvement in brain health is the cause. After my initial weight loss success, I increased my exercise, which improved my heart health even further. I can’t recommend the lifestyle enough, it has dramatically changed our lives and our health for the better. Very interesting. Thanks for sharing you experience. It’s a good idea to remember that a rapid pulse can be a symptom of food allergies. I have found that my resting pulse rate goes from around 80 to around 135, after I consume soy products, especially soy protein isolate. What about situations where LDL-P is high, but the small LDL-P count is low? Would you focus on particle count or on particle size? I’m happy to respond to your comment but would prefer to do that in the comment section of the article you cited as it doesn’t really fit well here. Will do. I wasn’t sure if you were monitoring older posts.